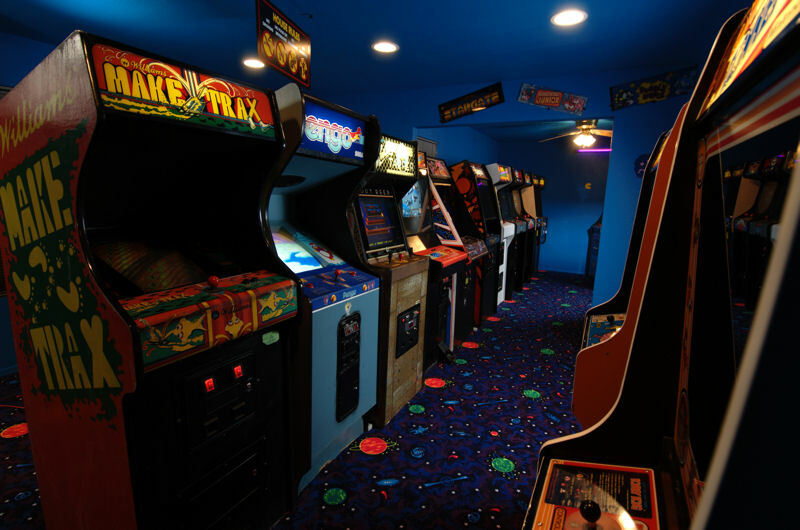 In the old days, when kids went to the arcade, they went with friends. These days, kids lock themselves in their rooms alone with their gaming device. That isn’t social, or is it? Sony and Microsoft don’t agree with these statements. Their latest products, respectively the Playstation 4 and Xbox One, have social media integrated. They blend the online and offline world. For example, when a friend finds a legendary item while playing ‘single player’, the position of this item appears on your single player map too. There are countless communities where people spread their love for gaming. People interacting, collaborating and sharing. Building new relationships, maintaining them, even ending some. It’s like people are all around you, but are they really? Is it the same as having a real person standing next to you, breathing? What is the difference? Do you think people are less social because of these changes in gaming that are supposed to make it more social? –	Hunt, T. (2013) ‘5 Ways Video Game Companies are Leveraging Social Media’. 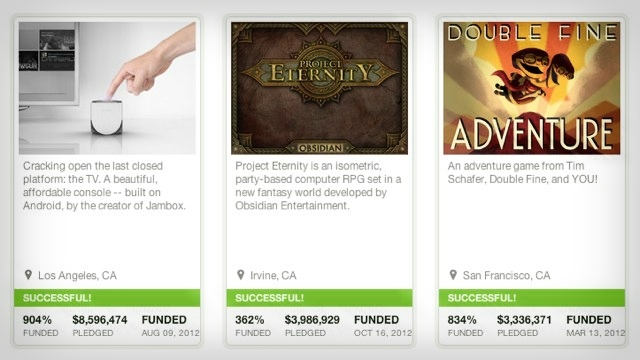 Visited on 4 November 2015 via https://www.socialmediaexplorer.com/media-journalism/5-ways-video-game-companies-are-leveraging-social-media/. –	Harper, E. (2013) ‘Insiders Explain How Social Media and Video Games Are Merging’. Visited on 4 November 2015 via http://sproutsocial.com/insights/social-media-video-games/. Nowadays there are a lot of social media channels through which we can communicate with others. You might have an account on all of them or maybe only on a few. A survey was held among American teens to find out which social media channels are most popular amongst them. A surprising finding might be that Facebook is becoming less popular for teenagers. The survey included 9,400 teens from 13 till 19 years old, coming from households with an average income of $68,000. Around 56% of the teens were male. The results showed that Instagram was the most important and popular social media. One third of the teens ranked Instagram first. Twitter ended second in the survey, ranked first by 20% of the teenagers, which is a little better then Snapchat’s 19%. It might be surprising that Facebook is not as popular under youngsters as you might expect. 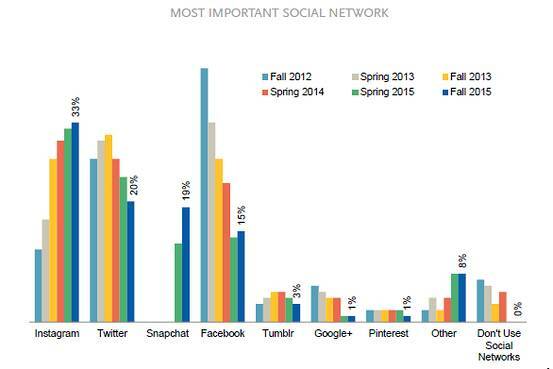 Only 15% of the teens considers Facebook as their most important social network. The results are also in the figure above. From Facebook’s perspective 15% can be considered as slightly disappointing. However, we must not forget that Facebook bought Instagram in 2012. Even though Facebook is losing interest from teens over the years, the growth of Instagram makes up for this. Facebook’s core audience is getting older and the figure shows this as Facebook was by far the most important social networking site for teens in 2012. So should Facebook be disappointed with the results? I don’t think so. Facebook still owns the most popular social networking platform for teenagers and has the ability to focus on an older core audience now with their own platform. This gives Facebook the possibility to provide social networking platforms that suit anyone. So now you know which social media are most popular and important for teens, did you expect this result? And what would be your personal order of social media? And what do you reckon Facebook thinks after seeing the results of this survey? Click Here and Earn $1,000!!! I guess you’ve all come across these ads on the internet. Some of you may have clicked on them. Lately, these kind of ‘ads’ are disappearing. Those were/are all scams to get your personal and financial data or infiltrate your computer with viruses. Other (real) advertising banners have also become less and less effective, amongst other things thanks to these scams. What can we do to make online advertising effective again? From a jaw-dropping 50-90% Click Through Rate to a poor 0.1% CTR (MacDonald 2015). You could say banner ads are not an effective way to promote your product, service or company. There’s also a term describing the phenomenon where website visitors consciously or subconsciously ignore banner-like information. 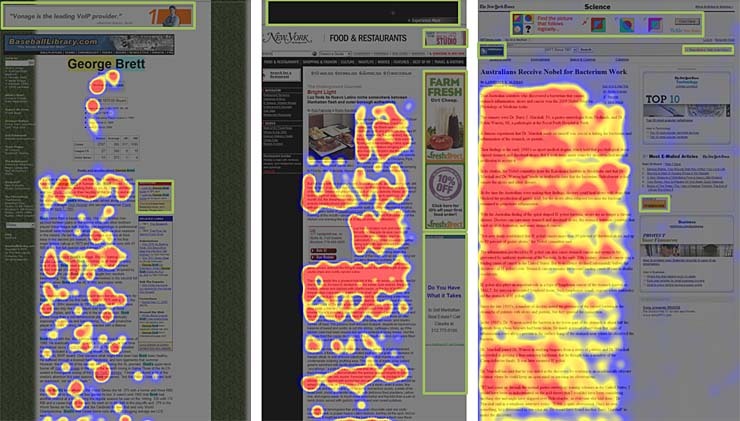 This is called banner blindness (Nielsen 2007). Yet, there are some ways to improve your (banner) advertising. Media rich engagement ads are ‘voluntary’ ads. In other words, they expand and play, once you hover above these interactive ads more than two seconds. Beware, consumers may also develop banner blindness to these engagement ads. Banner blindness does not extend to audio, thus Podcasts are another effective alternative to traditional banners. For example, Spotify uses audio advertising like this. However, hearing the same voice and text over and over again, can be very annoying for consumers. The opposite of Sponsored Posts and a very effective kind of advertising posts is User Generated Content. In short, consumers themselves post about you on their social networks creating a ‘buzz’. Be careful though: this ‘buzz’ can also be a negative one. The idea behind Content Marketing is not creating ads that look like content, but actually creating content. “Don’t sell anything, just be useful.” Take a look at CMO.com, Adobe’s initiative (MacDonald 2015). Another great way to increase advertising effectiveness is not to improve these banners, but rather on how to replace these ineffective (banner) ads. The answer to this problem is: using apps. The Starbucks app does more than just advertise its products. If you’re interested, you can read more about it in the article. Do you know other new, creative ways to advertise? Let me know in the comment section below! – Gupta, S. (2013) ‘For mobile devices, think apps, not ads’, Harvard Business Review 91(3) 71-75. – MacDonald, M. (2015) ‘Better than Banner Ads: Smart ways to spend your ad dollars in 2015’ via http://www.tintup.com/blog/better-than-banner-ads-smart-ways-spend-ad-dollars-2015-muriel-macdonald/ on September 23, 2015. – Nielsen, J. (2007) ‘Banner Blindness: Old and New Findings’ via http://www.nngroup.com/articles/banner-blindness-old-and-new-findings/ on September 23, 2015. So, in the case of Pewdiepie’s channel there are some signs of social commerce. For example, every month Pewds gets a package containing several collector items which are all related by theme, like ‘Villains’. He unboxes the items on screen and comments on them. At the end of the video he advises people to also buy these ‘Loot Crates’. The video below is one of the examples of this word-of-mouth on his channel. Another important way companies gain a lot of awareness is when Pewdiepie plays their game. Then, the so-called Oprah effect comes into force. The Oprah effect is the effect that an appearance on a famous show can have on a small business. 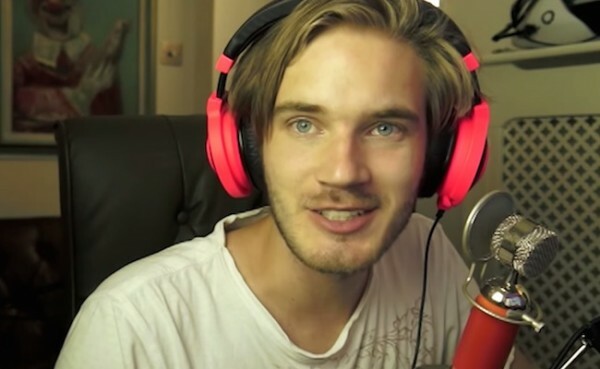 (Investopedia 2015) Because Pewdiepie nearly has 10 billion views, a recommendation can have a significant influence on the game developers. Is he telling the truth? Or is he lying and exploiting all of his subscribers? That making money is his main motive? –	Marsden, P. (2010) Social Commerce: Monetizing Social Media, Hamburg: Syzygy. Social media and networks are as social as selling. A complaining Tweet about a company can be picked up by a different company and maybe a few hours, days or weeks later you close a deal with that other company. Social media can be used for various reasons, but these days it’s all about selling and engaging. Of all kinds of social media, I think Twitter is the one which is the easiest. How many times have you posted a complaining Tweet because your phone was not working properly, because you couldn’t make a phone call, when a store gave you a damaged item … Been there, done that. How fast do these company actually answer? Most of the time, they don’t even take the time. Luckily there are quite a few other companies which do answer, because they have implemented a great social media strategy and they put time and effort in their customers. One example I would like to give is a campaign from KLM called ‘KLM Surprise’. KLM wanted to surprise its customers with something they could use on their trip and that wasn’t too big. They gave away about 40 gifts to their customers and made a video showing how they did this. Even though 40 gifts is not much, people were tweeting about it and even that same month the KLM Twitter Feed was viewed more than one million times. It is a great way to start interacting and engaging with your customers. People will tell others about their experience, it is a trending topic on social media and it will give a better Return On Investment than placing a billboard somewhere. Facebook also gives opportunities to engage with customers. The more you can reach out to customers, the more they will actively participate on Facebook and the better they can engage their customers. The less campaigns per day, the better. So put time and effort in the quality of the campaign, not the quantity. Adding a picture to the campaign, increases total reach and companies should avoid posting between 14:00-15:00. When the campaign is focused on getting Likes and Polls increase the total reach of the campaign, as does the day on which the campaign is posted. Campaigns posted on Monday, Tuesday and Wednesday have the highest total reach. I tried to think about reasons why the day and time for advertisements are so important for reach. I think it’s because more people work from home at these days and between 14:00 and 15:00 a lot of people are busy with their work of school. What do you think? Take a look at the infographics. Facebook or Twitter…? So, Twitter can be used to search for complains or setting hashtags out which will be shared. Or you can use Facebook where people can like and share your message. Facebook can create much more rich content then Twitter, but Twitter may be easier. Many pros and cons. Do you like to follow a brand on Facebook or Twitter? What do you prefer? Giamanco, B., and Gregoire, K. 2012. Tweet me, friend me, make me buy. Harvard Business Review 90(7/8) 88-93. Li, T., Berens, G. and de Maertelaere, M. (2013). Corporate Twitter Channels: The Impact of Engagement and Informedness on Corporate Reputation. International Journal of Electronic Commerce, 18(2), pp.97-126. 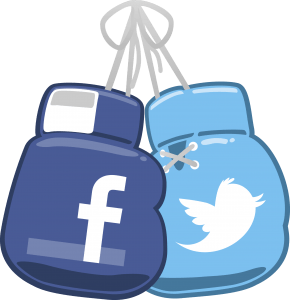 Social media is the latest platform for advertising, but it does not provide clear data regarding return on investments (ROI), a matter that marketers appear to be fixated on. However, is ROI really worth worrying about when using social media for marketing? Until recently, the main forms of marketing were television, print, and radio. These are the traditional approaches. Up until now they have been the preferred marketing mediums because firms can predict the outcome using these methods and are able to rely on it more heavily because of its consistent past, but most importantly because firms are able to determine their ROI (Weinberg, 2011). However, social media is not able to generate ROI in dollar form, making way for uncertainty and generally leaving marketers uneasy because they do not know how well their campaign strategy is working; in comparison to what they are familiar with and what marketing budget to set for the future. What Weinberg chooses to point out is that although the ROI for social media does not come in the form of dollars, it can be generated by social currency, which occurs from the relationship investment made by the company with its consumer. Unlike traditional methods, this can create long-term benefits rather than short, drastically saving costs since consumers on their platform comment, share, like brands’ social media posts, which all their friends will be able to see, giving the company exposure without them having to really work for it. At the end of the day though, it falls down to how well the company markets itself (social mix), as different social media platforms are needed depending on the purpose and objective of the company (Weinberg, 2011). Not only, but in order to maintain this effective standard, mission control centers need to be set up to allow marketers to monitor activity on their social platforms, engage with customers, collect and analyze data received from these interactions and apply them to their business and improve. Therefore, if they wish to continue to grow, their customer activity must be noted and applied. Hoffman shared very similar ideas in regards to firms needing to stop fixating on the traditional ROI, and instead measures customer’s social media investments because that is where the long-term benefits will come from (Hoffman, 2013). Hoffman focused on the 4 c’s: connections, creation, control and consumption, which are all coordinated by the consumer. It is up to the firm to ensure they stay up to date based on these four principles because it is the consumer that is exposing the brand to new audiences and most of all, the value of posting one simple tweet could prove to be of great worth to the company (Hoffman, 2010). In 2008, technology company Cisco proved just how useful social media marketing has become. Instead of advertising their upcoming product launch on traditional platforms, they chose to solely focus on using social media. As a result, Cisco saved over $100,000, ninety times more people show up to the event than ever before, one thousand blog posts were published along with forty million other online comments and the event resulted in an award for Best Marketing (Hibbard, 2010). Hibbard, C. 2010. Social Media Launch Saves Cisco $100,000. Hoffman, D. L., and Fodor, M. 2010. Can you measure the ROI of your social media marketing? MIT Sloan Management Review 52(1) 41-49. Weinberg, B. D., and Pehlivan, E. 2011. 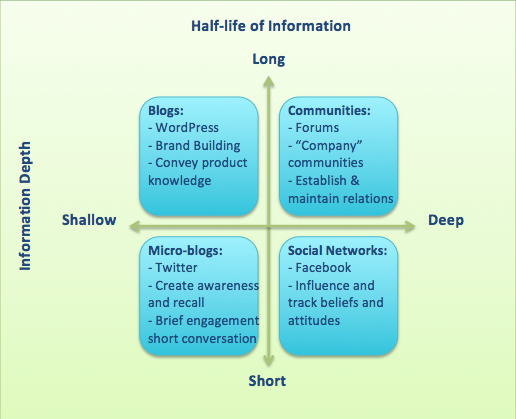 Social spending: Managing the social media mix. Business Horizons 54(3) 275–282.